What’s cooking for Visual Expert 2017? Between 2 major versions of Visual Expert, we typically publish a number of minor releases, each of them bringing new features – on top of enhancements and bug fixes. The new features for Visual Expert 2016, released last year, were unveiled throughout the year on the Visual Expert blog. In addition to the blog, a more comprehensive list of new features and enhancements is published in the Visual Expert update list. Below are a few examples of new features expected with Visual Expert 2017. As always, this list is subject to change, as some of these new features are not yet finalized. Visual Expert 2017 will introduce a new feature set, to compare 2 versions of your code. You will be able to select a previous code analysis, and compare it with the current one. The treeview will show the changes at object & method level. The source code view will highlight the changes character by character. A New Code parser will analyze MS SQL Server databases and MS Transact-SQL Code. It will be possible to combine it with other Visual Expert analyzers, and work on systems composed of several technologies. 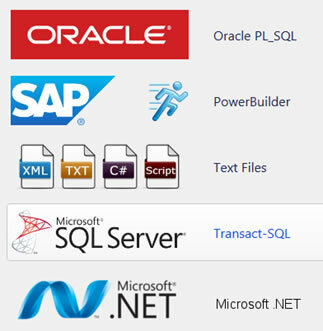 We will provide similar features for SQL Server as for Oracle and PowerBuilder, to help understand, evolve, document, review and optimize code. A few months after SQL Server, we are looking to release another code parser to analyze .Net code. It will also be possible to combine it with other code analyzers (Oracle, SQL Server and PowerBuilder). It will also include similar features to help understand, evolve, document, review and optimize code. Unlike other code analyzers, you will be able to decompile and debug your .Net code, even if the corresponding source code is not available: Visual Expert will read and automatically reverse-engineer .Net assemblies. New version of Visual Expert for Oracle, with additional features to understand and evolve complex PL/SQL code. A New Ribbon menu will improve the user guidance and provide additional options. Additional macros and documentation templates for Code review and Code performances.